I can't stress enough how "accessories" make the outfit. They remain one of the most effective ways to accomplish a stylish appearance. Many of my girlfriends spend a lot for a nice pair of earrings. I have never had my ears pierced, not even my lobes. Seeing as I don't wear earrings, my jewelry box is home to my gold bangles, necklaces and nothing else. During my school years, my mom would buy me gifts for my birthday like gold bangle or gold necklace. If diamond is the hardest material on earth, then gold is the most precious metal. But the truth is I prefer white gold over yellow gold. My daily basics are all in white gold; necklace and my ring. Necklaces vary in their worth and designs. To enhance their beauty and attractiveness, pendants are added. There are a lot of pendants to choose from. To this day, almost any woman would love to receive a piece of tiffany jewelry as a gift including me! Venerable New York jeweler Tiffany & Co. unveiled the latest creation of resident jeweler Paloma Picasso. Known the world over for her bold designs in highly polished metals and colorful gemstones, Picasso has now created a deceptively simple collection of necklaces called 20 Carats. 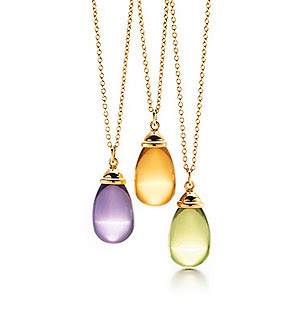 Available in either sterling silver or 18 karat gold, the delicate looking 18 inch supple chains easily support gemstone pendants weighing 20 carats and available in a wide variety of gems: amethyst, citrine, yellow quartz, rock crystal, onyx, blue chalcedony, and more. If you know somebody that was born in February, their birthstone is the amethyst. And these people are particularly lucky because amethyst is a varied and versatile stone. For one, it comes in many different shades of purple. This means that you can wear amethysts whether you prefer the light, almost translucent purple or the deep, rich purple. Amethysts are also easily faceted, so they make an ideal gem for rings, necklaces, and earrings. Well, the fashion possibilities are endless! Oh yes! Def white gold is classier than yellow, to me la! This one oso from RM Mon? So nice la all ur topics this month! Tell me abt it, the shower was refreshing….very the hot outside, no wan to leave my house like dis! I have two holes on my left ear and one on the right, oso pierced my nose he he heheh! RM hates me this month Mon, still nothing for me huhuhuhu! yesd u did one, not fm RM Mariuca? Yeah painful! Automatically my tears came out, I didn even realize! Yeah but that’s the only one…and topic oso on medical alert! Now nothing on my dashboard huhuhu! Oh yeah, u got disconnected right yest? Nemind can drop and click today! I hope I get the choc one! And the baby bedding he he… come to me RM PB! Hi Monica!! So your birthday is on Feb? So full now oh no…he he! Haven dropped or clicked or anything lol! Hey Mon, just got back! I went out for besday dinner, belanja our fren fatty crab! He he! You? Yeahhhhhh so lazy la to drop and click and post, although… I am working on my red carpet post now he he! out the whole day, came back take shower first...so hot lah! Oh yeah so hot la today…just now eating at FC oso sweating out there! Lucky brought lotsa tissue lol! :-$ :-$ :-$ you do get the best opps Mon!